Conservative media outlets, led by Fox News, are attacking the city of Houston for subpoenaing a number of local pastors who were part of the right-wing opposition to the city’s LGBT non-discrimination ordinance that is suing the city now that the anti-discrimination law is in effect. But their claims that religious liberty should keep the pastors’ public addresses secret ignores the fact that subpoenas of parties relevant to a lawsuit are a typical part of the legal discovery process. Sermons Are Not Immune To Being Subpoenaed. As The Washington Post’s Eugene Volokh explained, precedent suggests that information typically protected by the First Amendment can still be subpoenaed if it's relevant to a legal investigation. This is especially true in situations where sermons were recorded and distributed for public use. 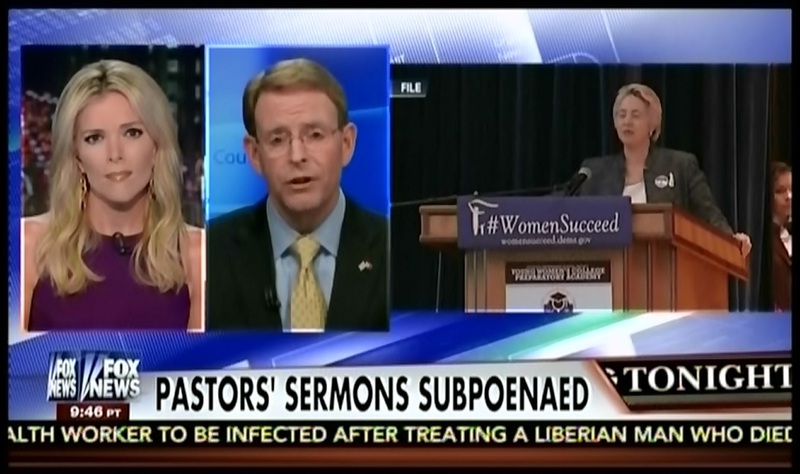 The Subpoenas Are Meant To Gather Information About Improper Church Behavior. The goal of the subpoenas is to gather information to support the city’s case that HERO opponents behaved inappropriately when gathering signatures to repeal HERO. City Attorney David Feldman cited a training video showing one of the subpoenaed pastors explain the rules for signature gathering at a church presentation, pointing out that such “political speech” is fair game and might support the city’s case for dismissing certain signatures. [W]hat happens when you file a lawsuit? You open up yourself and your relevant friends to discovery. Are the correspondences between these pastors and the Christian parties who filed the suit relevant to the case? It is possible that a judge could determine this is the case. That is what this subpoena is about. And as any savvy lawyer would do, the defendants’ attorneys cast the largest net possible in requesting information. In my opinion, it is unnecessarily broad. In my opinion, the vast nature of demands violates several of the checks and precedents built into the court’s rules for discovery… But that’s part of what’s good about it. Those checks are there for a reason. Let’s be calm and file a demand that they be followed first before we cry end of the world. And sure enough, ADF’s motion to quash, or at least modify the subpoena, cites these very principles and checks. "Though Feldman stood behind the subpoena in an interview Tuesday, he and Parker said during the Mayor's weekly press conference Wednesday that the wording was problematic. Feldman is monitoring the case, he said, but had not seen the subpoena written by outside counsel working pro-bono for the city until this week. Parker said she also did not know about the request until this week. There's no question the wording was overly broad," [Parker] said. "But I also think there was some misinterpretation on the other side." The debate over Houston’s non-discrimination ordinance was riddled with conservative misinformation, including the myth that the measure would infringe on religious liberty. Now that the measure has passed, conservative media outlets are eager for evidence that their absurd horror stories are coming true. The city’s broad subpoenas may be easy targets for right-wing spin, but the boring reality of civil procedure is much less unusual than conservative media outlets would have their audiences believe. Texas Values' Jonathan Saenz: Gay Activists Are Trying To "Put People In Jail"